You Are Purchasing One Custom-made Bangle, in size 10.0 With FREE Optional Features Available. Item's Pictures and its Design Serve as Examples Only as This Listing is For a Custom-Made Design You Create. Please Feel Free to Ask Any Questions About This Listed Offer. Smaller Adult and Keiki (Children) Hand Sizes Available From Sizes 5.0"-13.0" in Widths From 6mm-100mm Wide. Please Request a Free Quote on Other Sizes. 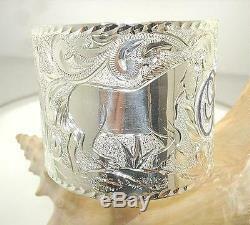 Brand New, Never Used Custom-Made Silver Hawaiian Heirloom Bangle. 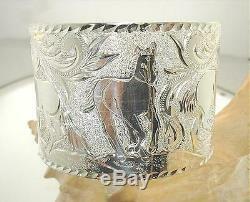 925 Sterling Silver (Not Plated, Not Bonded, Not Filled) Heirloom Bangle With Hand-Engraved Accents. Hand-Cut and Hand-Engraved, Colored Enamel, Sand-Matte and High Polish Finish Background, Diamond-Cut Border Edges. Measures 9 3/4" on the Inside to Fit a size 10.0" Circumference Hand. 169.8 grams, Flat Extra Heavy, 1.75mm Thick. This Beautiful 100% Hand-Made Sterling Silver Custom Bangle is Created With a Mixed Sand-Matte and High Polish Finish Background. The Design Features the Three, Ka lio (Hawaiian Horses) and Scrolls Pattern. Beautiful Scrolls Adorn the Sides and in Between the Horse's Poses. The Scrolls Are Outline Etched. The Top and Bottom Border Edges Are Diamond-Cut to Produce Nice Sparkles. Scroll Work Borders the Top and Bottom Around the Front Name. 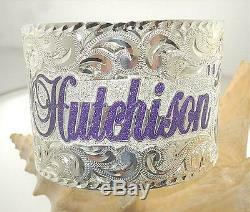 The Name is Crafted in Raised, High Polish Letters Filled With a Sparkling Purple Enamel Using a Balmoral Script Font. Superb Attention-to-Detailing For Those Who Love Horses! Add Your Name and Inside Engraved Message/Date For No Extra Charge. As This is a Custom-Made Bangle, You Can Request Added Optional Features at No Extra Charges. Additional Options Are Inclusive in the Price of This Bangle Which Can Include. Standard, Script, Bamboo, or Samurai Lettering. Raised, Raised Filled with Black/Color Enamel, Raised Filled with Clear/Color Sparkling Enamel. Partial/Full Scalloped, Diamond-Cut, or with Smooth Edges. Free Inside Personal Engraved Inscription. Ll Designs and FREE Optional Features Will Take Approx. 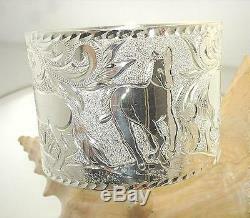 Item's Pictures With Name and Engraving on Bangle is For Example Only. It is vital that your know the correct Hand-size when ordering Custom-made Bangles to avoid costly alteration sizing adjustments you will incur. When SIZING FOR A HAWAIIAN BANGLE - Take a soft measuring tape and tightly measure the circumference of your very tightly clenched hand with your four fingers straight and your thumb turned in to touch your ring finger or pinky (this should make your hand's circumference the smallest size possible). Please measure over your knuckles (fist area) using inches. This would be your approximate hand size. Please remember that it is your HAND that is to be accurately measured, and NOT your wrist. The solid bangle must be able to squeeze on and off over your hand comfortably, yet rest nicely on your wrist and not easily slide off your hand. You may also go to your nearest jewelry store or any jewelry counter and ask them for your bangle size, if they have handsizers. Due to the custom details of this jewelry, all sales are final and I do not take responsibility for incorrect sizing of your jewelry ordered. Resizing Alterations are Available, but very costly to adjust! Makes a Great Gift or Treat Yourself to Start or Add to Your Collection of Fine Sterling Silver Hawaiian Heirloom Jewelry. Superbly 100% Hand-Cut From Scratch! Stamped STER or 925 For the Assurance Mark of Solid. Item's Picture/s Enlarged to Show the Fine Details. This Item Only Ships Within the United States. 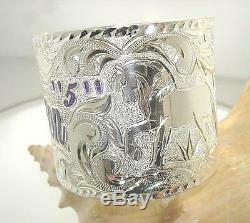 The item "50MM STERLING SILVER HAWAIIAN CUSTOM MADE PERSONALIZED HEIRLOOM BANGLE 10.0" is in sale since Thursday, September 15, 2011. This item is in the category "Jewelry & Watches\Handcrafted, Artisan Jewelry\Bracelets". The seller is "hawaiialohajewelry" and is located in Mililani, Hawaii. This item can be shipped to United States.